Breastfeeding while waiting for boarding in Ontario International Airport. The “Hold and breastfeed your baby anytime, anywhere” poster. Well said. But still, during my 30 days in Taiwan, I didn’t see any nursing mom in public. There were breastfeeding rooms everywhere. They were in airports, shopping centers, government buildings, metro stations, even on the train. And there was often a line in front of the precious breastfeeding room. I once waited for 20 minutes for the breastfeeding room on a high speed rail train. While 20 minutes sounds acceptable, it felt like forever when you were holding a hungry, crying baby. I would totally breastfeed on my seat, if only the young gentleman sitting next to me seem to be not so uncomfortable. Things are a little bit better back in America. We don’t have that many breastfeeding rooms, yet we have more breastfeeding moms in public. I think it’s a good thing. 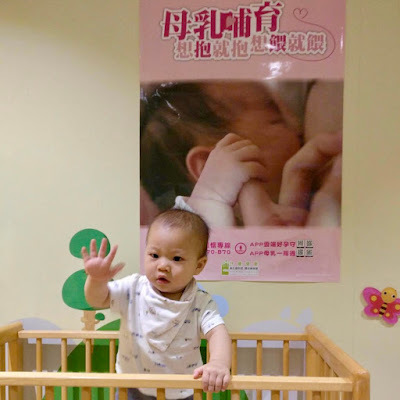 My experience in Taiwan remind me how important exposure is when it comes to normalize breastfeeding. While we applaud the availability of nursing rooms for moms who feel most comfortable with some privacy, breastfeeding in public should be encouraged. In order for breastfeeding to be truly normalized, it must be seen and incorporated into daily life. Only the kids growing up in places where breastfeeding is openly practiced will internalize breastfeeding as being normal way to feed and nurture a baby. Plus, we don’t want a society where people think the *only* place for breastfeeding is hidden away in a private room. Really, I don’t want to stand in line for 20 minutes again just for a breastfeeding room. In a 2016 CDC survey of over 4,000 male and female adult respondents, 64% of people believe that women should have the right to breastfeed in public places. That number should be 100%. Luckily these attitudes are continuing to shift. Here, I want to invite all my fellow nursing mothers to make a point to breastfeed openly and support other nursing moms. For the moms who are not used to breastfeeding in public, let me provide a few tips for stress-free experience for you and your baby. If you’re feeling anxious about breastfeeding in public, try practicing at home in front of a mirror so you can see what you look like while nursing. I promise that you’ll notice you’re not exposing as much of your breast as you imagined, because your baby’s head is covering it. What you wear when breastfeeding in public makes a difference. Personally I found it’s worth it investing in a few items of nursing wear to make life easier. It’s not necessary to buy specific breastfeeding clothing—you can simply layer up two of your normal tops. In one of my favorite nursing dresses. Know your breastfeeding rights also helps. Read more about your legal rights in my previous post here. Happy openly breastfeeding! Photo Credit to Mu-huan Chiang. READ MORE blogs by To-wen Tseng.